The Yukon packs more than enough power to cook for the hungriest crowd. With its 448 square inch cooking surface and two 30,000 BTU burners, this stove makes cooking food for groups both large and small a breeze. Also features a threesided windscreen and removable legs for easy portability. Bottom burner housing minimizes hot/cold spots and gives extra wind protection. You'll love this stove for all your outdoor cooking needs. BaseCamp Stoves and Cookers are designed and manufactured with premium materials and components to deliver years of satisfaction. These camping stoves feature heavy gauge frames that dont easily fold, bend, or wrinkle. Each comes complete with a gas regulator ready for attachment to a one pound propane cylinder or a 20 lb. tank with accessories(sold separately). At basecamp or in the backyard, you can count on the Pioneer two-burner stove to provide hearty and delicious meals. With our 14 inch cooking system, you can switch between a griddle for breakfast in the morning to an artisan pizza oven for dinner in the eveningall on one stove. Each powerful burner offers 30,000 BTU for the toughest of cooking jobs, and the removable legs make this stove easy to pack. No matter what the adventure, the Pioneer will be ready for it. Make it a part of your outdoor kitchen today. Turn your Cylinder Stove into an efficient hot water dispenser with our Cylinder Stove Hot Water Tank. Constructed of 20 Gage Stainless Steel our tank is designed to fit our Alpine Cylinder Stove (CS14) and is suitable for cooking and drinking water. Tank includes a brass spigot for instant hot water and a full length hinged lid for adding additional water and easy cleaning. Great for melting snow into drinking water. There's nothing better than a cool, crisp morning in the outdoors with a pile of steaming bacon, eggs, and pancakes. And there's no better camp stove to create that meal than the Rainier Two Burner Stove. With a non-stick aluminium griddle included, you have everything you need for good food in the outdoors. Two burners give you space to cook up breakfast on one side and heat a kettle of water on the other. Matchless ignition makes it easy to start up even after you realize you forgot the matches. When you're ready to head home, you can fold the suitcasestyle lid down and use the convenient carry handle. In other words, if you're looking for compact design and easy cooking, the Rainier is the stove for you. Add it to your outdoor kitchen today. Yukon 2 Burner Stove The Yukon packs more than enough power to cook for the hungriest crowd. With its 448 square inch cooking surface and two 30,000 BTU burners, this stove makes cooking food for groups both large and small a breeze. Also features a threesided windscreen and removable legs for easy portability. Bottom burner housing minimizes hot/cold spots and gives extra wind protection. You'll love this stove for all your outdoor cooking needs. 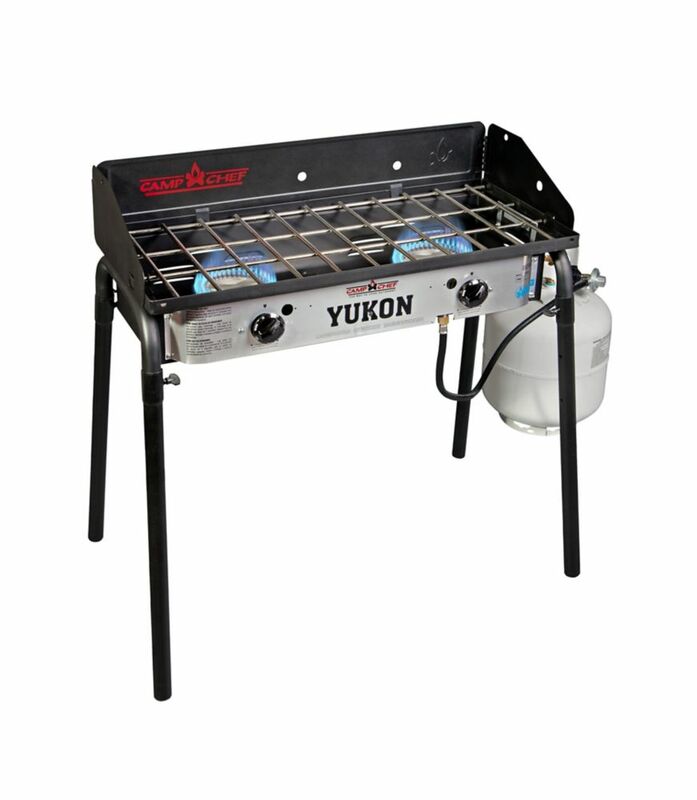 Yukon 2 Burner Stove is rated 5.0 out of 5 by 7. Rated 5 out of 5 by Cosenza from Awesome Grill This is the best grill we have ever bought. We also bought the griddle that fits it and so easy to make breakfast when out camping. No more mess in the trailer. It cleans up really easy also. Rated 5 out of 5 by Byrd_Huntr from A new favorite! I love my vintage green white gas stove, but I wanted to expand my outdoor cooking options with a larger two burner stove that would be sturdy enough for my patio, but would also be light enough to break down and take camping when we do our group cookouts. The Yukon is just the thing, and is well built and sturdy, looks good, and works like a charm. The removable legs are sturdy, the wind screen pops off easily for cleaning or transport, and the propane hose and regulator seem to be of good quality. Rated 5 out of 5 by Melissa from Love it - so versatile I wanted a pizza oven and a griddle - but couldn't justify using either enough to make the investment. Then I found the stove - grill, griddle, boil, fry, bake. Great investment. Heavy, well built. Rated 5 out of 5 by AECarlson from Heavy Duty I just bought a Yukon today. I'm getting ready for a family camping trip in May. I have not fired it up yet, but I can't wait. This stove is the real deal. Extra heavy duty construction, should last for many years. I set it up in the living room (did NOT hook the tank up) just to sit and stare at it. Very happy with it. Rated 5 out of 5 by TC from EXCELLANT STOVE Also have the BB30L grill added to it does a awesome job grilling or cooking. The wind blocks work good I use mine at the beach and it gets windy sometimes. Rated 5 out of 5 by Pat from Excellent outdoor stove We own two of these stoves. We keep one on the back deck all year round. It is great to have the extra burners. We entertain a lot. It's great to cook on the deck when it's hot out. We have also taken it camping. Rated 5 out of 5 by Anonymous from I'm going to buy a 2nd for next years tr I like good quality products and this stove is great. Built to last, very powerful. I wish my home stove was as good!